I dabble in many kinds of crafts but the one I always come back to is crocheting. I learned to crochet from a neighbour when I was a very young girl. She was an elderly lady who spent her days making all kinds of baby sets and other items for bazaars to raise money to help others. I have followed in her tradition and over the years I have made lots of items for charity as well as relatives and friends. For the most part my granddaughter keeps me in projects these days. She came to me on a Saturday afternoon and informed me she needed a Twilight Sparkle from My Little Pony, helmet cover for her ski helmet. I said ok, Nana will work on one for you. She then proceeded to tell me she would be going skiing the next day around noon and would like to have it for then. I couldn’t find a pattern anywhere so I asked for her helmet. I would keep it overnight and see what I could do. 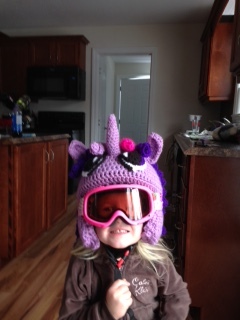 Needless to say she left for the ski hill with her helmet cover the next day. This past weekend she celebrated her 4th birthday. This year she is all about mermaids. Ariel – the little Mermaid graced her birthday cake and birthday balloons. Even her bathing suit for the pool party had Ariel on it. After the swim she arrived in the party room in a long dress that made her look like a mermaid. 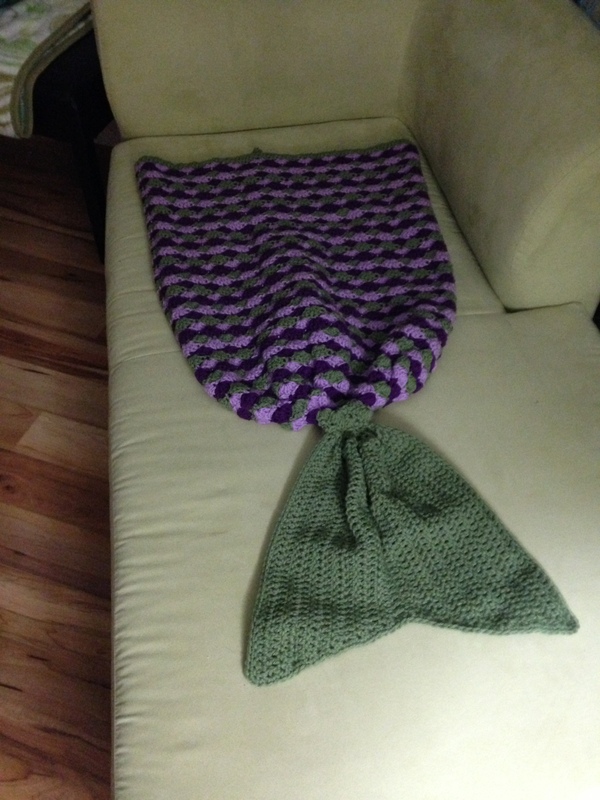 5 days before her party she saw a mermaid tail blanket that she wanted. It is a throw to be used while sitting on the coach reading or watching TV. Nana got right on it of course. There were lots and lots of rows to be completed, but in the end it was in the gift bag at the party, ready to be used. I hear the blanket was such a hit that she slept in it the night she received it. Nana never complains too loudly when she is asked to make something. I enjoy the challenge. I believe the whole reason we are given our gifts is to make ourselves and others happy. Why not use them to do just that?